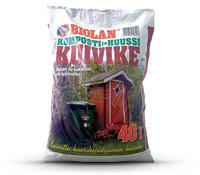 Biolan Bulking Material is a blend made of pure, dried and ground conifer bark, wood and peat for composting and dry toilets. Applying it regularly keeps the compost mass airy and ensures the composting is efficient and odourless. After every bowel movement or when adding organic waste to the compost bin add some bedding material. Store in a dry place.